Try explaining to someone from Auckland, Wellington or Christchurch that Dunedin has a traffic problem and you will probably get back a blank stare. In fact, there are more vehicles on the city’s roads than ever before - but does that mean more time spent sitting in traffic? Tim Miller investigates. If you use Portsmouth Dr to get to and from work in the morning and have been late at some point in the past couple of months, you are probably not alone. Increasing congestion between 8.30am and 9am has meant the Dunedin City Council has needed to tinker with the phasing of the traffic lights along the harbourside road. There have been several indicators the city’s roads are being used more, by more motorists. Last year, international mapping company TomTom released figures showing congestion in the city increased about 6% in 2016. Lights at the Strathallan St, Orari St and Midland St intersections all had their phasing changed to deal with the increasing number of motorists using the road, particularly during the morning commute time. 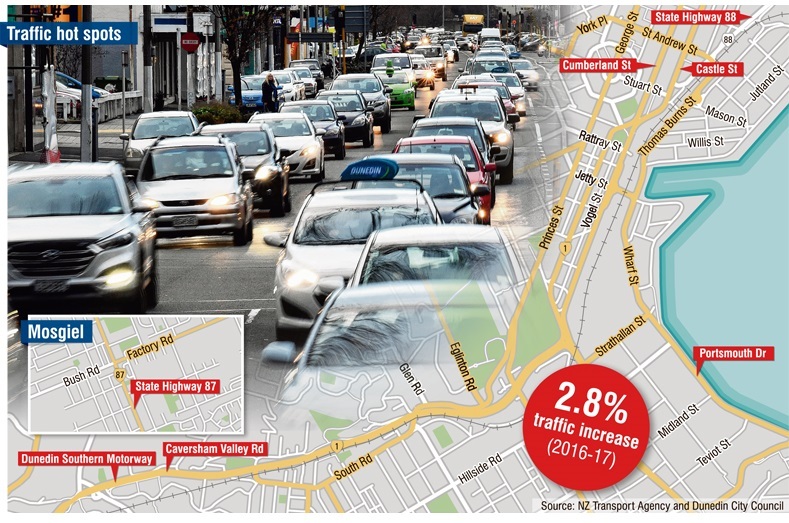 A report for Enterprise Dunedin by economic development agency Infometrics found the traffic flow in the city increased 2.8% from December 2016 to December 2017. The report also found there were more vehicles in the city than ever before. The number of registered vehicles in the city increased from 4957 to 5321 and commercial vehicle registrations also rose, from 977 to 1259, during the same period. NZ Transport Agency network manager Chris Harris says the agency does not record congestion levels, as they can be attributed to various different factors, such as school drop-off and pick-up times or major sporting events. Instead, a network of traffic counters is used to measure the traffic flow on State Highways 1, 87 and 88. Some of the traffic counter sites operate continuously, while others collect a week’s data every three months. Continuous traffic counters have recorded annualised growth of between 1% and 2.5% per year. The non-continuous counters (four weeks of data per year) recorded annualised growth of between 0% and 4.9%. Despite the increase, Mr Harris said there had been no major changes to the phasing of traffic signals run by the NZTA. Traffic signals were already designed to efficiently keep traffic flowing. Governed by a combination of programmed time delays based on vehicle travel speed and vehicle detectors in the pavement, the signal network provided a series of green traffic signals (also known as the green wave) when one travelled on the city’s one-way system, Mr Harris said. During off-peak periods, the signals changed to an on-demand system, which used the detectors to provide a more timely response, he said. Apart from the state highways, the city’s roads are governed by the city council. City council transport strategy manager Nick Sargent said the council did not track traffic in real time, but traffic-counting tubes were moved around the city to record traffic numbers at hundreds of locations throughout the year. Apart from Portsmouth Dr, he was not aware of any major traffic issues on the city’s roads. "We had more traffic coming off Portsmouth Dr, which seemed to be causing problems, and we tried a number of settings and then settled down with what’s there now." Council staff could view CCTV footage to identify any problem areas and the light phasing could be adapted in response to any significant issues. "We have a screen here in Dunedin we can look at to catch any issues, but all the controlling of the lights is done in Wellington at the Traffic Operations Centre." Compared with other cities, it was still "fairly easy" to get around Dunedin, he said. Anecdotally, motorists have complained about getting caught in more and more traffic jams since the start of the year. In the past year the city council has received more than 130 complaints about intersections and traffic signals. Hot spots include the Southern Motorway, North Rd and Portobello Rd. Both Mr Sargent and Mr Harris said there was likely to be a link between disruption to traffic and the roadwork season. "I do think the roadwork season doesn’t help with this conversation, in that if you look at the traffic in the city, it peaks in about March, when all the schools and university goes back and then it settles down again," Mr Sargent said. If there had been any issue with the traffic it would probably settle during the winter, when the roadwork season slowed down, he said.